I love and adore this cake. This is another one of those long ago recipes that we’ve been making in my family for as long as I can remember. Made from scratch, the ingredients are simple and the recipe itself is not fussy at all. 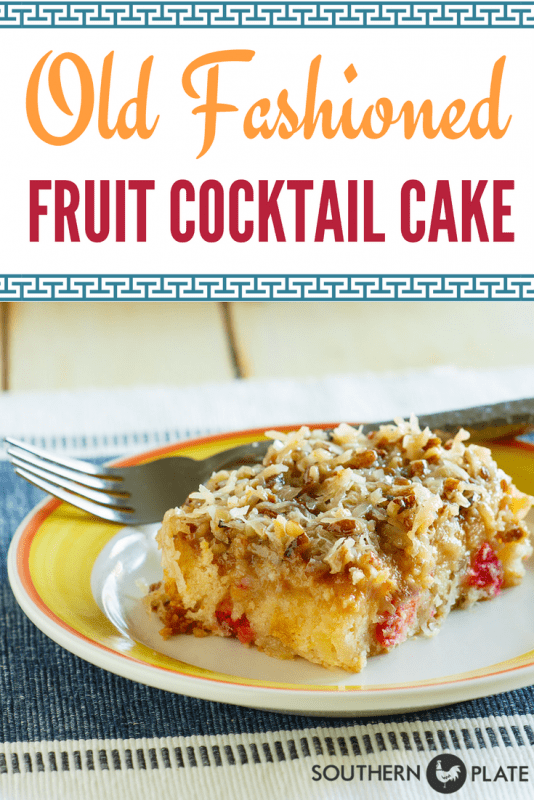 If you’ve never had fruit cocktail cake before, you cannot imagine how delicious it is. I especially enjoy it warm. Then again, I also enjoy it room temp…and cold…and…oh darn it. I just love this cake any way you can give it to me. It is a very unique and moist flavor, unlike anything you’ve ever had! For the cake you’ll need : Self rising flour, vanilla, sugar, eggs, and a can of fruit cocktail in heavy syrup. Easy Peasy! Place eggs, sugar, flour, fruit cocktail (juice and all) and vanilla in a mixing bowl. Mix on low speed until well blended. Scrape down sides and mix again for about another minute. Spray a 9×13 inch pan with nonstick cooking spray and pour batter into pan. Bake at 350 degrees for forty five minutes or until golden brown. 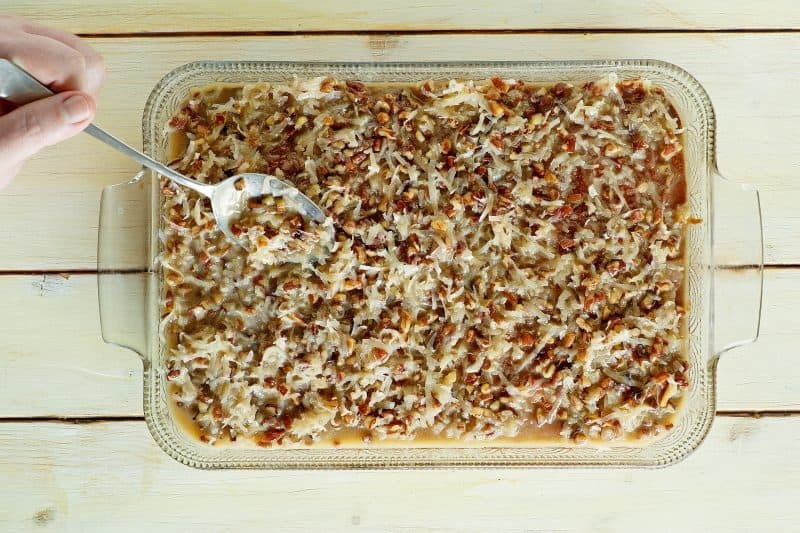 To make the topping, place evaporated milk, pecans, butter, sugar, more vanilla, and sweetened flaked coconut in a medium to large sauce pot. Stir. Bring to a boil, while stirring, over medium heat. Once boiling, boil for one to two minutes. This icing will remain pretty runny, which will be great when you pour it over your hot cake and it soaks all in. Take hot cake out of the oven. Pour hot icing over hot cake, spreading as you pour. Work fast now because this is going to immediately soak down into the cake and you don’t want coconut to be concentrated in one area and completely absent in the other. Spreading it as you pour it will help avoid this problem. Taste a bit of delicious nostalgia! Preheat oven to 350. Spray a 9x13 baking dish with cooking spray and set aside. 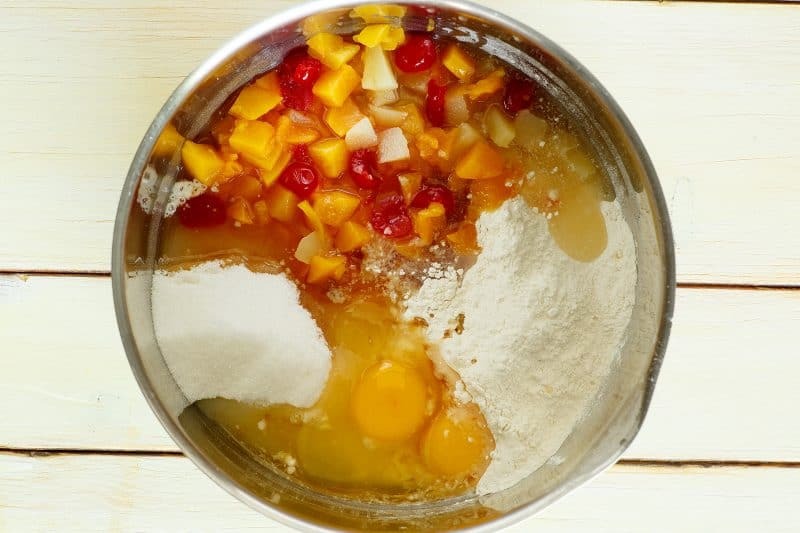 In a large mixing bowl, place all cake ingredients and beat at low speed until blended. Scrape down sides and beat again at low speed for one minute more. Pour into prepared pan. Bake for 45 minutes, or until a toothpick inserted in center comes out clean. While the cake is baking, combine all sauce ingredients in a medium sized saucepan. Place over medium heat and bring to a boil, stirring constantly. Once mixture is boiling, continue stirring and boil for 1-2 minutes. 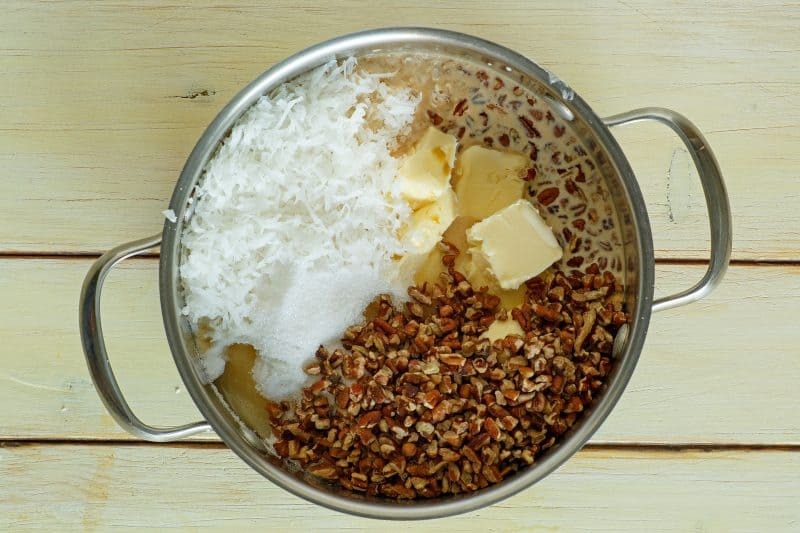 Pour over hot cake and quickly spread with a spatula for even coverage. Please note that this recipe calls for self rising flour in order to rise. That really takes me back…in our family we call it dump cake! I will have to try your recipe – looks delicious. Yeah, that looks good! If I hadn’t just made cookies this afternoon, and if I weren’t going to be gone all evening, I would totally make this tonight! I’ll have to scrounge together the ingredients and give it a go soon! I’m so happy with the response I’ve gotten to this cake! This is another recipe that I almost didn’t post! I mulled it over all week, thinking it just wasn’t something others would be interested in. LOL! Thank you both so much for commenting!!! Let me know if you make it! White Lily flour? Oh my gosh! They just closed the plant where I live. I’ll miss that just like I did the smell from JFG coffee roasting in the same area until a few years ago. That recipe makes me laugh and brings back such happy memories. I made it many, many times as a bride. My mother-in-law gave the recipe to me. It was “new” like Watergate Salad a few year later. The funny thing is, she cooked with gas; my oven was electric. Every Fruit Cocktail cake I made was white. Her’s were amber as was her icing. In the 40+ years she was my mother in law, we never figured it out. The mention of it brought laughter. I’m so happy to find this!! I had lost my recipe that I had from my Aunt many years ago. This looks like the same and sounds the same. I LOVE this cake!! A friend gave this to me &I had lost this recipe. Thanks so much for posting it. She didn’t give the frosting, and yours is a bonus!!! Thanks so much for taking the time to post it. I hope you enjoy the recipe Kathryn!! I am an avid follower of your great blog. I have nominated you for an award. Pop over to my blog for the details! Rose: WOW! Thank you firstly for being an avid follower! I appreciate each and every person who takes the time to read southern plate! Secondly, THANK YOU for the award!! That was so very kind of you!!! Hey Christy! I know this cake as dump cake too. Except you don’t mix it and you add Sprite (or Pepsi if you’re doing chocolate). And girl, you need to stop worrying whether we’ll be interested in your recipes! Everything you do is great. You can do no wrong! Just made this cake and it is absolutely delicious! It probably won’t last the day in my house! I’m in Alabama too and it’s HOT so I think I’m going to refrigerate the cake and serve it cold. Rachel, I’m so glad you like it! I bet it would be divine cold!! What part of Bama are you in? Its a rare treat to have an Alabamian among my readers!!! You gave me a great idea just now! 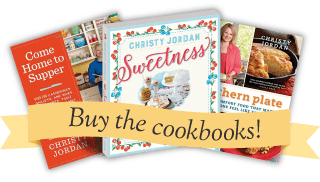 I have a few cold cake recipes built up that I haven’t posted yet and I just LOVE refrigerator cakes in the summer time! Stay tuned, I’m going to post them ALL this week thanks to your inspiration! Pat said…Was so glad to find this recipe. My mom used to make it alot. It was one of my favorite cakes that she made. Can’t wait to make it. I visit every single day and LOVE your site and recipes. How much is a can of coconut? I usually buy it in a bag. I made this several times, years ago. The woman who shared the recipe with me placed the cake, icing and all, under the broiler for a few seconds before serving. My husband’s grandmother used to make this cake all the time. And it is his absolute favorite! His mother gave me the recipe several years ago and it was a disaster. It turns out you can’t use and electric mixer on a can of fruit cocktail. Who knew? Of course, my mother-in-law got a huge laugh out of that. So, I gave up. Until I came across the recipe here. I made it a couple of weeks ago as a surprise and my husband said it was just like Nanny’s. Success! And know he wants it again for his birthday cake. Thanks! My mother used to make this cake… She is blind now and cant make it but she asked me to make it for my Dads 76th birthday. We couldnt find the recipe but yours is perfect. You saved the day and I will make this cake many times in the future. Thanks. I was called upon to make a dish to a funeral dinner. I got to thinking about ingredients I had in the house and fruit cocktail cake came to mind. So I got on line and found this wonderfully delicous recipe. And it’s also easy to make, now I get request for potlucks to bring “the cake”. :)) Thanks for the recipe. This is a great cake. I made it for the first time years ago (around 30 actually) and won a blue ribbon in a 4H contest with it. But the name I know it by is interesting. When I found the recipe and made the cake it was called Ugly Duckling Cake and in my mind that is what this cake will always be to me. It is a yummy cake and very easy to make. I have also used a yellow cake mix for the cake portion of the recipe and it turns out great that way too. Thanks for the memories. 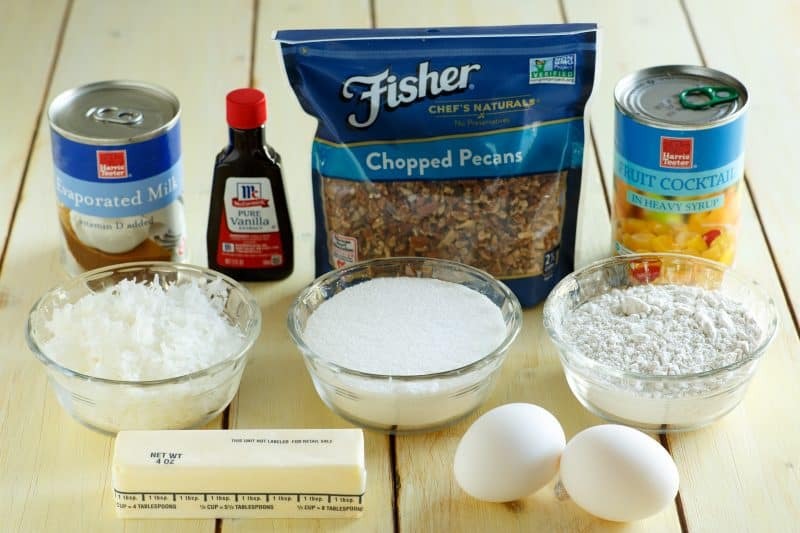 Ugly Duckling Cake has brown sugar and nuts sprinkled over the batter before baking. 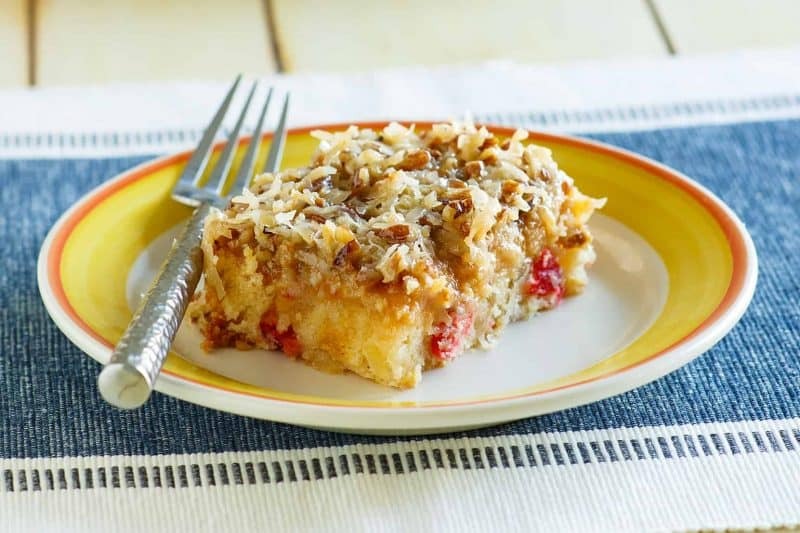 Just a little different- the recipe came from Baker’s Coconut many years ago. I just returned from a family reunion in Alabama(I live in North Carolina). I have always known it as “Big Mama’s Fruit Cocktail Cake”. She made it in the 40’s & 50’s. I made it for the reunion & it was devoured!! 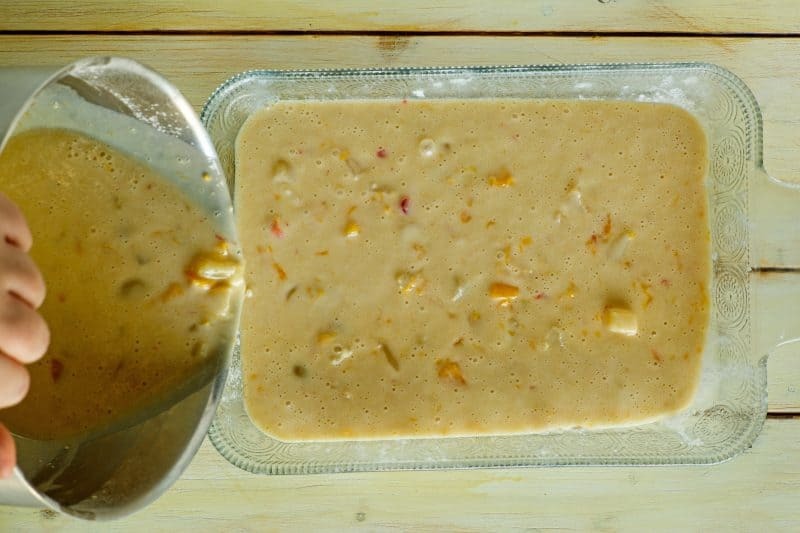 Few people & especially the younger generation had never heard of fruit coctail cake. Now they know what a treat it is!! Baking at 375 for 45 minutes is way too long for this cake. I only baked mine for 30 minutes at this temperature and it was so dry we could not eat it. Try 325 for 30 minutes. I’m so sorry you had problems with this. My recipe actually says to bake at 350 for forty five minutes, rather than 375, so I can see how it would have been overdone. I’m sorry you misread that. Also, if you can bake a 9×13 inch cake at 325 and have it done after thirty minutes, your oven might be baking a little hot. It sounds like the temperature is off by about twenty five degrees, meaning that if you baked the cake at 375, it actually got about 400 degrees for that time. I always check my oven at least once a year to see if it is baking properly or if the temperature has gotten a bit off. You can do this buy buying a simple oven thermometer at Wal Mart or some other store. They sell for a few dollars and hang on the oven rack. For more information on calibrating your oven, check out my cookie challenge video at the link below. Actually I mistyped the 375. I did bake it at 350 for 45 minutes in 9 x 13 pan. My oven may be running a little hot, but I’m going to stick with recipe I’ve used in the past that suggests 325 for 30 minutes. Thank you so much for taking the time out of your day to let me know! I really appreciate you reading and hope to hear more from you, Lily! I want to do this cake for my friend whose birthday is coming up – her mom always made it for her as a layer cake. How long do you think it should stay in the oven if I do two 9 inch round pans instead of the 9×13 pan? ok this recipe is on thursdays menu. looks so good . This was a great cake! Very tasty and moist. I had several people ask for the recipe. You GO GIRL!! Thanks so much for the awesome recipes!! My mother used to make this cake, but I never had the recipe until now. I’m so glad I found it just in time for my company’s Bake Off last week. I made it as a layer cake and made a little more of the “icing” and just sort of dolloped it on top and let it run down the sides. Everyone raved about it! What a hit. Thanks for helping me bring back an old favorite. P.S. Mama also used that icing on her German Chocolate cakes. Delicious! Christy, can you make this with the no sugar added fruit cocktail?? Since my weight loss surgery, that’s the only kind I get!! BTW, I’ve adapted a lot of your recipes so I can eat them, too, by using splenda, or other no fat things (like cream cheese). But you seemed specific about the fruit cocktail in heavy syrup. Thanks for all of your wonderful recipes!! Its so funny to see this recipe somewhere else. My great grandmother used to make this all the time. I her recipe varied slightly- hers called for a little oil, but other than that its the same cake! I only make it at the holidays. Do you ever put nutritional information on your recipes? My husband is diabetic and I don’t bake as much as I once did because I don’t want him to be tempted. I do some diabetic desserts, however. I enjoy your website because I always need something “different” to take to church dinners. Sometimes it seems we have the “same old, same old” even though the food is delicious. Oh, this is delicious. We have had this recipe in my family for many, many, many years and have made it hundreds of times! 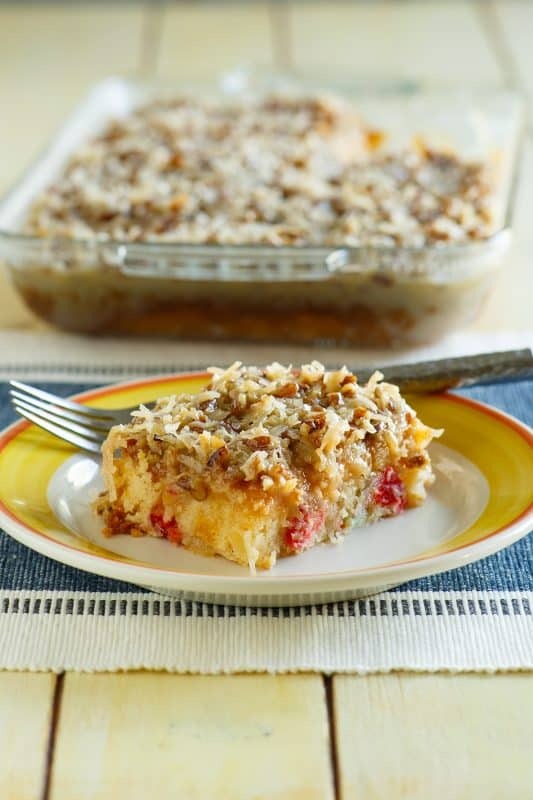 It is wonderful and easy and sooo delicious! My family likes it when I had some cinnamon/ginger/cloves to the mix. I also use the “tropical fruit salad” or canned peaches instead of the regular fruit cocktail and it is wonderful also! It is very hard to screw up this cake, very good for a first-timer and everyone loves it! Havent made this cake since i was a little girl. brings back fond memories of helping mom in the kitchen. thought i would make it for my two teenage boys. thank you.it was just as i remembered. Christy, I remember this wonderful cake from my childhood. Thanks for the recipe. Wanted to ask you a question about the Peanut Butter Brownies recipe. Would it be OK to use self rising flour instead of all purpose and omit the salt and baking powder? Also for the icing, omit the shortening and use 4 tablespoons of butter instead?